The Basilica i Temple Expiatori de la Sagrada Familia, commonly known as the Sagrada Familia, is a large Roman Catholic church in Barcelona, Spain, designed by Antoni Gaudi (1852-1926). 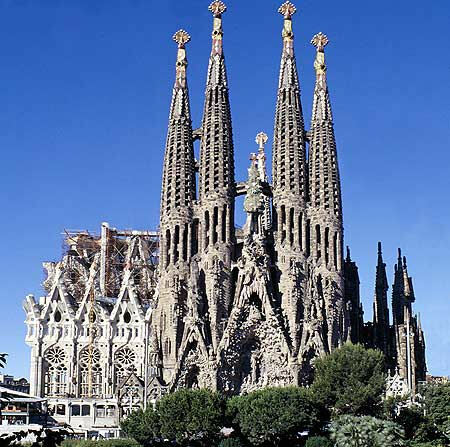 While never intended to be a cathedral (cathedrals being the seat of a bishop), the Sagrada Familia was planned from the outset to be a cathedral-sized building. Although incomplete, it was consecrated and proclaimed a minor basilica in November 2010 by Pope Benedict XVI. Construction of Sagrada Familia had commenced in 1882, with Gaudi becoming involved in 1883, taking over the project and transforming it with his architectural and engineering style - combining Gothic and curvilinear Art Nouveau forms. Gaudi devoted his life to the project and at the time of his death in 1926, less than a quarter of the project was complete. The construction progressed slowly as it relied on private donations and was interrupted by the Spanish Civil War in 1936, only to resume intermittent progress in the 1950s. 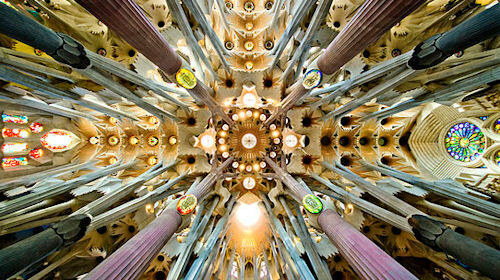 Construction passed the mid-point in 2010 with an anticipated completion date of 2026 - the centennial of Gaudi's death. The basilica has had a long history of dividing the citizens of Barcelona - over the initial possibility it might compete with Barcelona's cathedral, over Gaudi's design itself and over the possibility that work after Gaudi's death disregarded his design. Critic Rainer Zerbst said "it is probably impossible to find a church building anything like it in the entire history of art" and Paul Goldberger called it "the most extraordinary personal interpretation of Gothic architecture since the Middle Ages." Above, detail of the roof in the nave. Gaudi designed the columns to mirror trees and branches, which were in his eyes God's creation. Text based in part upon information taken from Wilipedia. Thanks to Sarah Katherine James for guiding me to the Sagrada Familia.